Dear friends – below are a few excerpts from my forthcoming book, “The Dark Side of Prenatal Ultrasound and the Dangers of Non-Ionizing Radiation.” I am releasing this information now because I feel it is urgent for people to know. Please pass this information on to others so that they may know and protect themselves and their children. “In fact, children are literally dropping dead from heart failure inside schools with wifi. It’s curious that this would happen twice to children just over 10 years old. There’s only 50,000 students in the entire school district. I did my research to find out if this was normal or abnormal. Turns out the estimate is 1: 1.3 million per childhood cardiac arrests. This was 20 times higher than expected. Far exceeds the level expected environmental influence. It should have been examined. It should have triggered a public health investigation. But it was only 2 kids, not a high number. “Students are experiencing cardiac arrest… at very high rates… In Mountain View school, there’s a 12-year-old boy who has tachycardia… There’s a 12-year-old that experiences nausea, vomiting, no fever, insomnia, blurred vision, and tachycardia, and she experiences this only in the classroom. There’s a 13-year-old boy who experiences a pounding heart, insomnia, headaches. He’s now moved away and all of his symptoms have abated. There’s a 6‑year‑old girl who has a “musical heart.” She has headaches, dizziness, and only experienced at school. Did you know that there’s an increase in sudden cardiac deaths among youth in the United States? [A 2009 study showed] a 6% increase in the rate of sudden cardiac deaths each year… among very healthy, fit kids, that are athletes. Even worse is the fact that malevolence is most definitely involved since the wifi radiation that now permeates schools and libraries across the U.S. and in wireless baby monitors as well, is being transmitted through the very same 2.4 GHz frequency used in microwave ovens known to cause seizures, chromosomal aberrations, tumors, infertility and much more. Western governments were warned in the 1990s by top Russian scientists about the 2.4 GHz frequency and the damage that might ensue if this frequency was used around pregnant women and children. “Babies are being put at risk of cancer by hi‑tech cot monitors which emit deadly radiation… Slow-pulsing microwaves blasted out by modern digital equipment may cause leukaemia, say scientists. Lab tests have also linked the radiation to potentially fatal brain tumours, breast cancer, headaches and disturbed behaviour patterns in kids. 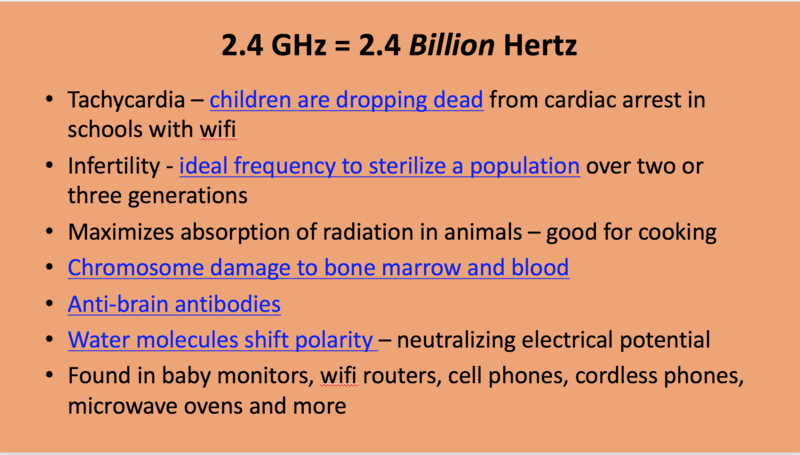 As if all of the above were not enough, the 2.4 GHz frequency is also the frequency that maximizes the absorption of radiation in animal tissues. In fact, frequencies as low as 225 MHz have been shown to cause radiation to penetrate deep into the body. Hence, our children are knowingly and intentionally being cooked with this radiation and yet, mum’s the word from the medical and telecom industries who are hell bent (literally) on continuing their radiation assault. To get a sense of what is happening inside the bodies of our children when they are exposed to these microwave frequencies, let’s examine what occurs inside a microwave oven when food is being cooked. Incidentally, exposure to 2.4 GHz microwave radiation (used in cell phones, baby monitors, smart meters, wifi routers, microwave ovens, etc.) causes a similar effect. In 1971, the U.S. Navy reported that microwave and radiofrequency radiation heat the bones and the bone marrow. Ultrasound falls within the radiofrequency and microwave bandwidth. ← Radiation Dangers – What About the Children?